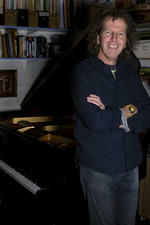 Alister Spence is highly regarded as one of the most creative and original contemporary jazz pianist/composers in Australia. His wide-ranging talents have led to performances with many musicians across the contemporary music spectrum, from the Australian Art Orchestra to Ed Kuepper, the Laughing Clowns and Paul Capsis. In recent years he has devoted his energy to writing and performing with his trio, the Alister Spence Trio, with Lloyd Swanton (the Necks) on double bass and Toby Hall (Mike Nock Trio) on drums and glockenspiel. This celebrated group has recorded four CDs of Alister Spence's original music: Three is a Circle in 2000 (released in Japan in January 2003 on the Earth Spirit Label), Flux in 2003, Mercury in 2006 and fit in 2009, all on Rufus Records, distributed in Australia by Universal Music. Mercury was nominated for Best Jazz Album 2007 at the ARIA (Australian Recording Industry) Awards. Flux was also nominated for an ARIA in 2004. fit was voted in the top 15 jazz /improv releases worldwide for 2009 by The Wire, UK. The trio has toured overseas 2006 and 2008. In June 2009 the Alistair Spence Trio was chosen by Brian Eno to perform at his Luminous Festival at the Sydney Opera House. Also in 2009 and 2011 Spence toured in Europe performing at the Vilnius Jazz Festival (2009) and club dates in Europe and the UK with (amongst others) Joseph Williamson (Tobias Delius Quartet) and Tony Buck. Spence's compositions have been featured on all of Clarion Fracture Zone's and Wanderlust's CDs, as well as CD's by Bernie McGann (2001 Aria-winning CD Bundeena), and the Australian Art Orchestra (Passion, ABC Classics). In 2010 the Australian Art Orchestra performed a commissioned full-length work of his, entitled Soak, at the Melbourne International Arts Festival. Alister Spence has also composed much music for film, working for acclaimed directors such as Tom Zubrycki, Allan Collins, Tom Murray and Ivan Sen. Together Spence and Ivan Sen wrote and recorded the soundtrack to Sen's first feature film, Beneath Clouds, first screened in June 2002. The score for Beneath Clouds was nominated for the Best Score at the Film Critics' Awards, and the Australian Film Industry Awards 2002. Spence's playing is featured on more than 30 CDs, many of which have won or been nominated for an ARIA Award. Over the years he has played with many of the finest musicians in Australia including Bernie McGann, Sandy Evans, Chris Abrahams, Dale Barlow, Ruby Hunter and Archie Roach, Tony Buck, Phillip Slater, Ed Kuepper, Paul Capsis, as well as overseas artists including Mark Helias (US), Barre Phillips, Andy Sheppard (UK), Satoko Fujii (Japan) and Jim O'Rourke. Spence has toured extensively in Europe, Asia and North America over the last 20 years with the Alister Spence Trio, Clarion Fracture Zone (a group he co-leads), Wanderlust and the AAO, performing at many of the world's premier jazz festivals and clubs, and on radio broadcasts for ABC, BBC, and WDR (Germany).